Yesterday a colleague (Karl) introduced me to a new craze that seems to be sweeping across YouTube called Harlem Shake. Last summer a dance track was released: Baauer - Harlem Shake (you can buy it on Amazon here: Harlem Shake .) Harlem Shake has now had new life breathed into it thanks to YouTube videos where people have started making crazy videos of themselves dancing to the Harlem Shake track. Part flashmob / part Gangnam style, part suggestive / part silly, Harlem Shake tends to be staged in two parts. Most of the Harlem Shake videos following the original seem to feature one person or a small group dancing before exploding into a large scale Harlem Shake event with lots of people joining in. 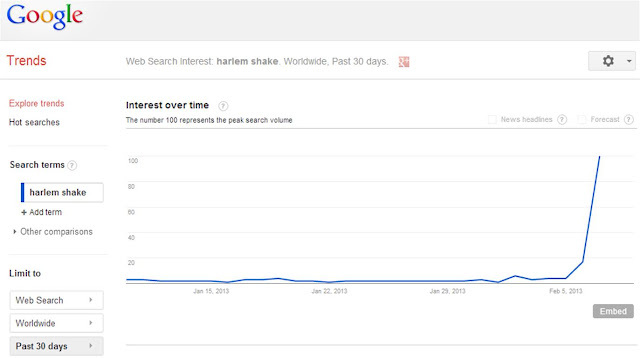 So how big can the Harlem Shake get? Harlem Shake in Lapland "extreme version"